The son is, of course, the future John the Baptist. And Mary arose in those days, and went into the hill country with haste, into a city of Judah; And entered into the house of Zacharias, and saluted Elisabeth. And she spake out with a loud voice, and said, Blessed art thou among women, and blessed is the fruit of thy womb. And whence is this to me, that the mother of my Lord should come to me? For, lo, as soon as the voice of thy salutation sounded in mine ears, the babe leaped in my womb for joy. And blessed is she that believed: for there shall be a performance of those things which were told her from the Lord. And Mary, with great joy, went away to Elisabeth her kinswoman, and knocked at the door. And when Elisabeth heard her, she threw away the scarlet, and ran to the door, and opened it; and seeing Mary, she blessed her, and said: Whence is this to me, that the mother of my Lord should come to me? For, behold, that which is in me leaped and blessed thee. But Mary had forgotten the mysteries of which the Archangel Gabriel had spoken, and gazed up into heaven, and said: Who am I, O Lord, that all the generations of the earth should bless me? And she remained three months with Elizabeth; and day by day she grew bigger. And Mary being afraid, went away to her own house, and hid herself from the sons of Israel. And she was sixteen years old when these mysteries happened. The Visitation is a very popular theme in art. 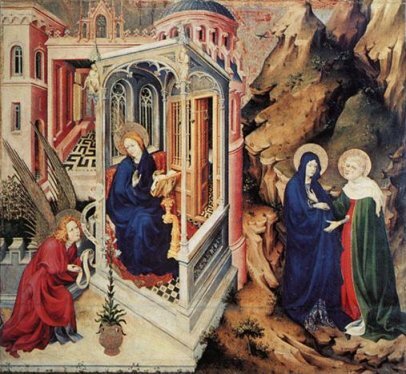 The version of the Annunciation by Melchior Broederlam (below left) we have seen before, includes a Visitation scene. 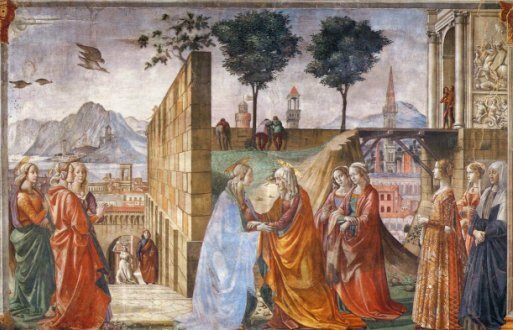 The wonderful fresco of the Visitation by Domenico Ghirlandaio (right) comes from Santa Maria Novella, Florence. The ladies on the left are presumably the virgins given to Mary as companions by Joseph; see What happened before (here) for a little more on this. There should be five of them: the three behind Mary and the two behind Elisabeth make up the number.